Drawing On Math: #MTBoS Booth! Yesterday I had a super tight schedule. 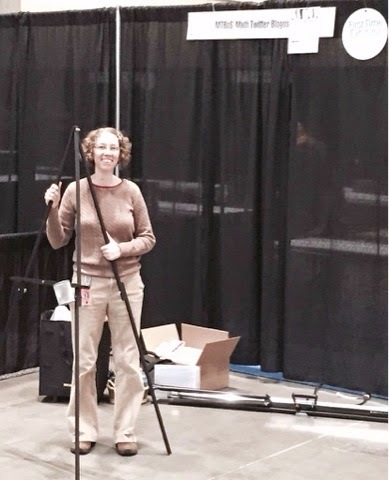 Around 2:45 I talked my way into the loading dock, the amazing Peg Cagle met me there and we were ready to set up the #MTBoS booth. And then... there was nothing there! No table, carpet, chairs or even that essential waste basket we were promised. Nothing but a sign (albeit a welcoming one). Luckily, there was good cell service so Peg and I set to work figuring out where the miscommunication happened. In the meantime, I did all the set up I could- I tightened the screws on the easel. Thank goodness everyone we spoke to was very prompt and helpful. They took my info, were apologetic and before I even made it home someone called me back to say we were officially approved for our promised package and it would be done by the end of the day. Carpet! Table! Chairs! Yay! Problem solved. Except the minor detail that I didn't have any time today to go in to Boston. So this morning I sent a tweet with a to do list and this photo of the mock table I had set up on my living room floor last week. By the time I got to lunch and checked my feed again, I found this! Thank you so much to Jennifer and everyone else who chipped in!! There are still a few more things to add, but look how much stuff we have! I can't believe it. Just a few weeks ago I was worrying that we would have a very sparse looking booth, but clearly Justin and I came up with more than enough to fill the space. One thing that arrived after this photo is a poster to go on the easel. Ashli designed a nice center logo and people will sign with their name and twitter handle around it. 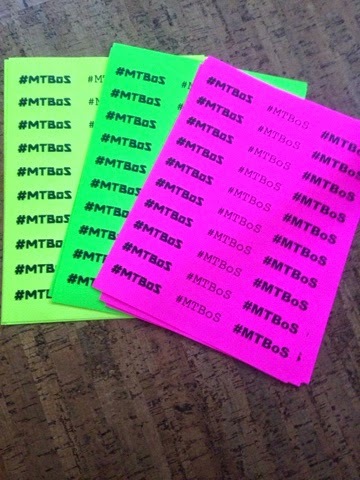 Anyone who has a twitter handle gets a sticker! These stickers go on your badge to signify "I think my online math community is awesome and I want to tell you about it." 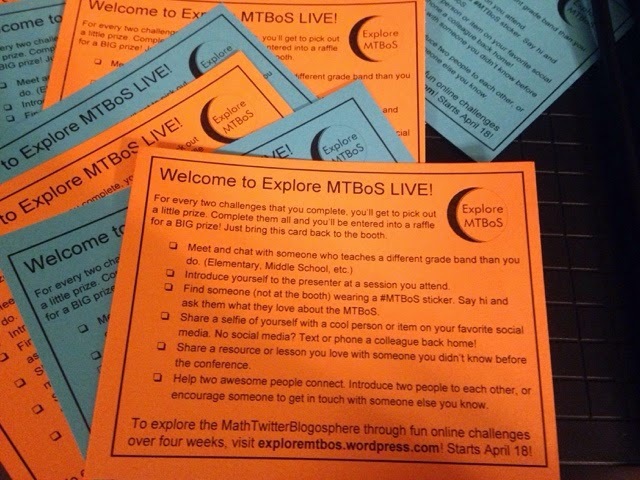 Not only will they get conversations started, it's one of the tasks on the #MTBoS LIVE scavenger hunt! 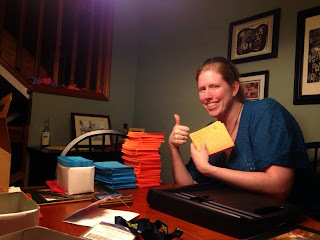 Ashli, my foster daughter and I cut out 2,000 of these - so please stop by the booth to pick one up. Then, take a selfie with people and tell them to go pick one up too! You're also going to want to get a bead on a string while you're there, because finding your bead buddy means an automatic big prize! The other way to get a big prize is to complete all six tasks on the card and then you'll be entered into a raffle for a big prize. 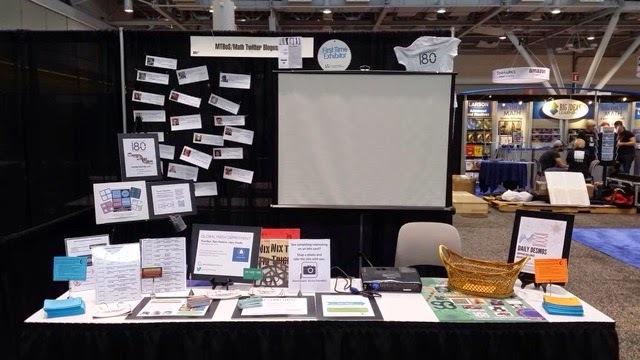 If you're at NCTM this week - come play with us! If you're not at NCTM, you can still play along. 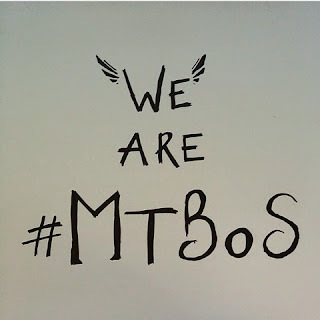 People will be asking questions from the @ExploreMTBoS account. There will be selfies to like and maybe even a competition to see who can snag a selfie with the most tweeps! Keep score from home and place bets on who will be the best networker. An even better way to deal with your #BostonJealousyCamp woes? Check out when the next math conference near you will be. See if they have an exhibit hall. 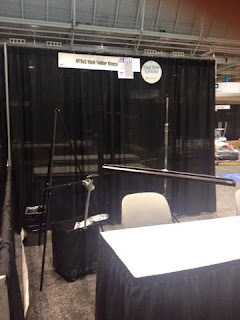 Ask if you can get a deal for MTBoS - for NCTM, a booth comes with 6 free registrations, for the price of 6 registrations. So we gathered 6 people, NCTM helped us pool our funding internally and ended up with a booth! Then they helped us out with the carpet and table. Justin and I have done all the work already, and we did it really strategically. We saved our to do lists and descriptions and emails. There's a google drive folder just waiting for someone to say they want to run a #MTBoS booth at their next conference. We'll ship you some supplies. The rest you can print from all the stuff we've saved in organized folders. You could have your own scavenger hunt! So don't be sad, get planning. Make this the first of many opportunities for the math teachers of the world to learn there's an amazing online community just waiting to talk to them about content and pedagogy and more. 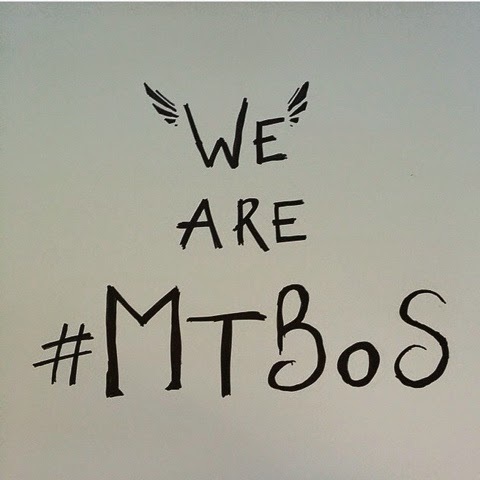 Or, at the very least, tweet out that Explore MTBoS is running an orientation starting Saturday. We need veterans to help support the newbies, and it's a chance for everyone to learn something new! Thanks to everyone who helped us get to this point. I can't wait to see what happens when our booth officially opens tomorrow!!! So cool!!! You are doing a great thing. I hope you have a blast, too.